Death is a stressful process for everyone involved. It’s incredibly painful for loved ones to be there and the dying person could be filled with fear of what’s going to happen to them next. Even when you’re lucky enough to be surrounded by loved ones when you pass, it’s still a very isolating experience since you must go alone. Maria was a singer and piano teacher her whole life. Music continued to be her source of comfort in her final days. Maria has had hundreds of students throughout the decades. Her influence spreads all over the country as her students grow up and do incredible things with their lives. Incredibly enough, one student worked at the hospice where she was being cared for. Joshua was Maria’s student when he was only 9 years old. They shared a bond with their mutual love of music that has carried on through the years. Music can be empowering and unifying. In this case, Joshua was also able to show love and comfort Maria during her end. 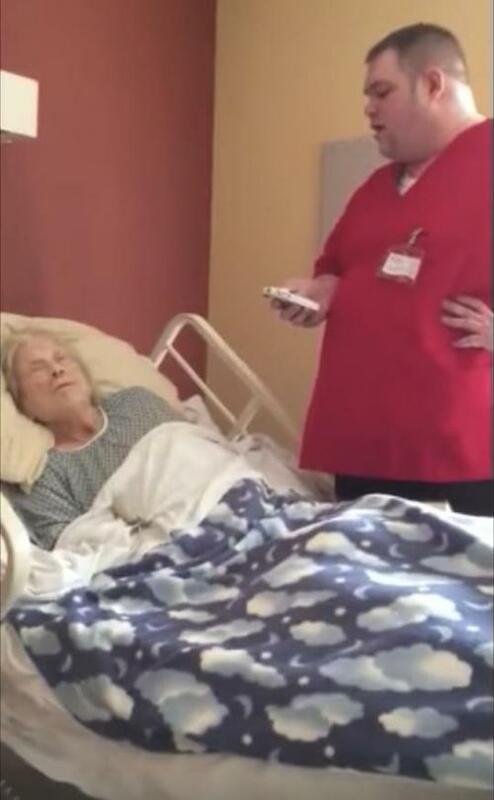 This clip of him singing to her will move you to tears. Maria’s final wish was to hear the song “How Great Thou Art” since it has been a source of comfort and strength for her throughout her life. Joshua is a great singer thanks to Maria, and he was happy to grant her dying wish. He wanted to deliver the best performance utilizing all of the skills Maria taught him as a child to send her off. He knew this is what she deserved. Joshua stood right by Maria’s side as he beautifully sings Maria’s favorite song. You’ll notice that Maria seems to relax immediately after Joshua begins.